After an unnervingly quiescent and remarkably warm February, March roared into California like a lion over the past weekend. A quick succession of powerful storms brought a very wide array of inclement weather conditions to the Golden State–from very intense rainfall (and associated modest flooding) and very strong frontal winds (which brought down many trees and caused power outages) in Northern California to bona-fide (and locally damaging) severe thunderstorms across a wide swath of Southern California. Double-digit rainfall totals occurred in orographically-favored spots in the northern part of the state, while several feet of new snow fell at the highest elevations of the Sierra Nevada. As creeks and rivers rose in response to this much-needed rainfall, so too did inflows to some of California’s largest reservoirs in the Sierra Nevada foothills. Folsom Lake, in fact, now has above average water levels to date–and the floodgates on Folsom Dam have been opened to accommodate the additional expected heavy precipitation over the coming week. Recent and upcoming rainfall is undoubtedly good news in a drought-stricken state. Even if precipitation were to stop falling today, all of California’s major reservoirs are in much better shape than they have been in years (though I’ll be the first to admit that’s a decidedly low bar). Sierra Nevada snowpack, while still below average to date, is quite substantial–and will continue to provide substantial inflow into reservoirs though the spring and early summer months (unlike during recent years). But although increased reservoir water storage will reduce drought-related pressure on most urban and many agricultural water users this summer, it won’t mitigate the tremendous ecological damage that has occurred throughout California’s extensive forests–which have experienced an astonishing degree of tree mortality over the course of our record-breaking drought. Nor will it directly solve the immediate water concerns of those living in certain water districts in Southern California that are dependent on local precipitation, or the long-term groundwater overdraft that continues in the Central Valley. As I discussed in the autumn, the most likely outcome of the powerful El Niño event in the Pacific was to bring partial–but not complete, or necessarily lasting–drought relief to California. What happens over the next month or so will dictate just how much drought relief occurs before the long, dry summer ahead. In the short term, though, there’s certainly a lot more water headed toward California. Another atmospheric river (or plume of concentrated atmospheric water vapor propelled by strong low-level winds) is taking aim at Northern California as I type, and will sag very slowly southward down the coast through late Friday. 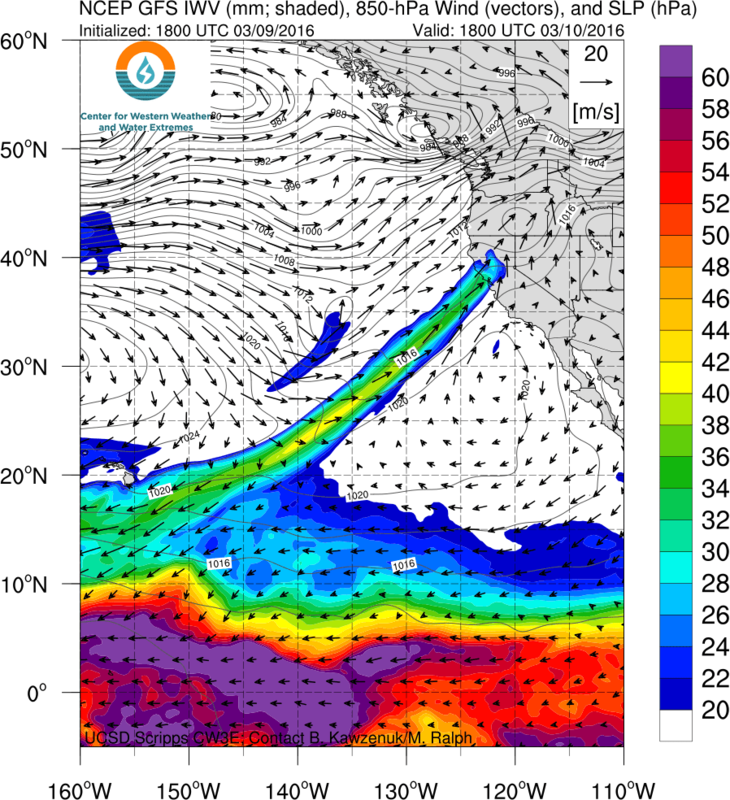 This particular atmospheric river exhibits an unbroken corridor of enhanced water vapor that can be traced all the way back to the Hawaiian Islands–which qualifies this event as a modest “Pineapple Express.” Atmospheric water vapor in this atmospheric river will approach all-time record values for the month of March (as did last weekend’s), so a juicy airmass will certainly be in place. The main concern over the next few days is that this very moist plume will stall out over some portion of Northern California on Friday, potentially leading to very heavy precipitation accumulations. This is of particular concern given that soils in this region are already saturated after recent rains, and rivers are running high. Additional heavy precipitation will likely lead to flooding of at least some degree–and this could start to extend to larger rivers in addition to smaller streams if this precipitation band stalls as much as is currently forecast. As is often the case with atmospheric rivers in California, just how much flooding occurs will depend on just how persistent the precipitation actually is in vulnerable watersheds. Also, the potential exists for a pretty extraordinary north-south gradient through Friday afternoon, with some model solutions bringing more than 6 inches of rainfall to the northern San Francisco Bay Area while San Jose–just 30-50 miles away–sees almost nothing! Given these uncertainties, the National Weather Service has already posted Flood Watches for a wide swath of Northern California, and these may be expanded further. 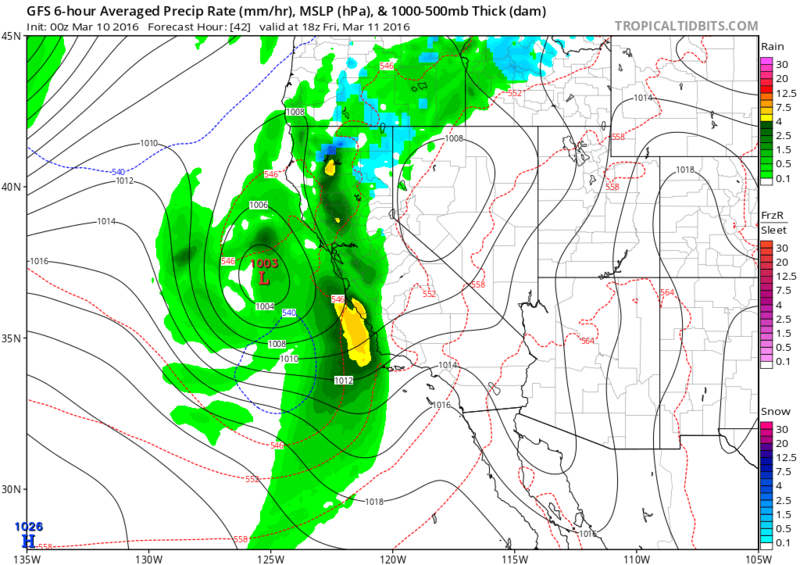 Everyone in California will get wet by late Friday, though, as a modest surface cyclone approaches the coast and allows the atmospheric river to finally slide down into Southern California. This late Friday system probably won’t be quite as strong as this past weekend’s in northern California, but could actually be stronger than the weekend storm was in Southern California. A period of heavy rainfall and gusty winds will occur throughout most of California around the time of cold frontal passage, and a few thunderstorms are once again possible. 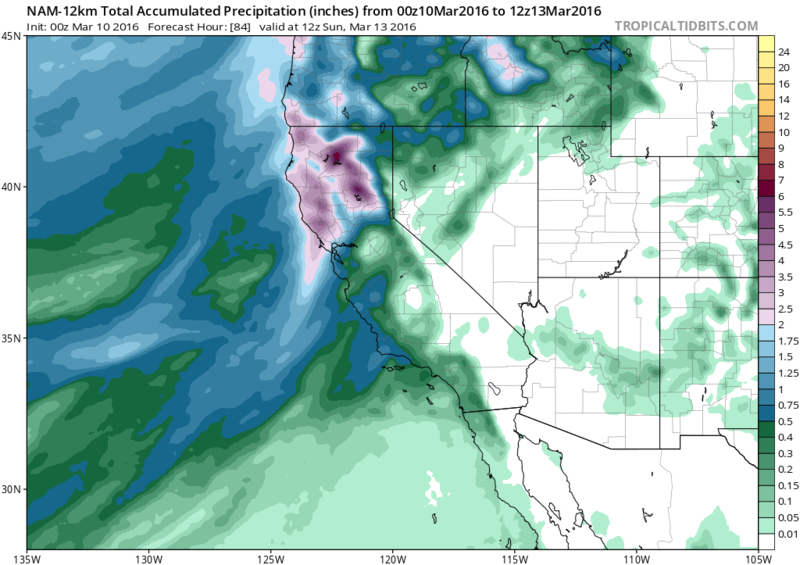 Yet another (slightly weaker) system will move into California by Sunday, bringing another round of widespread precipitation. Precipitation amounts (and snow levels) will be lower, though any additional rainfall by that point could cause at least minor flooding problems. California will see a multi-day break in the precipitation by early next week (and, if current forecasts hold, it should be a needed break from the heavy precipitation!). There are some signs, though, that wet weather will likely return once again by the middle of the month. 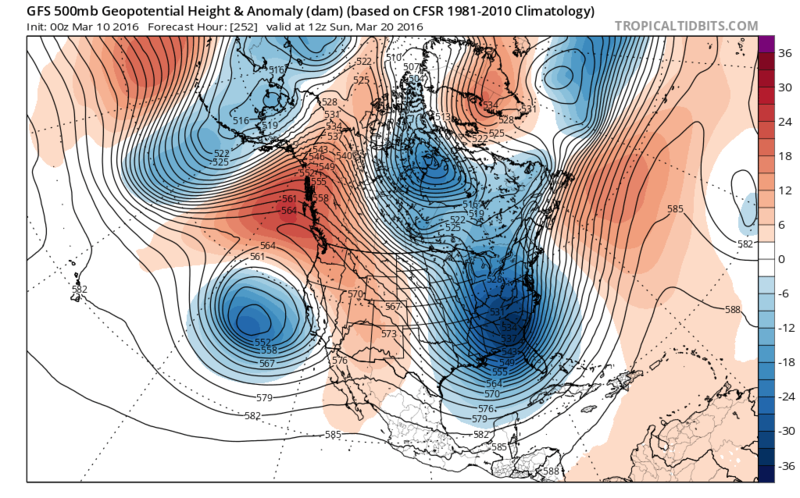 Model ensembles suggest that a strong ridge will develop over British Columbia, producing a “Rex Block” over the West Coast. 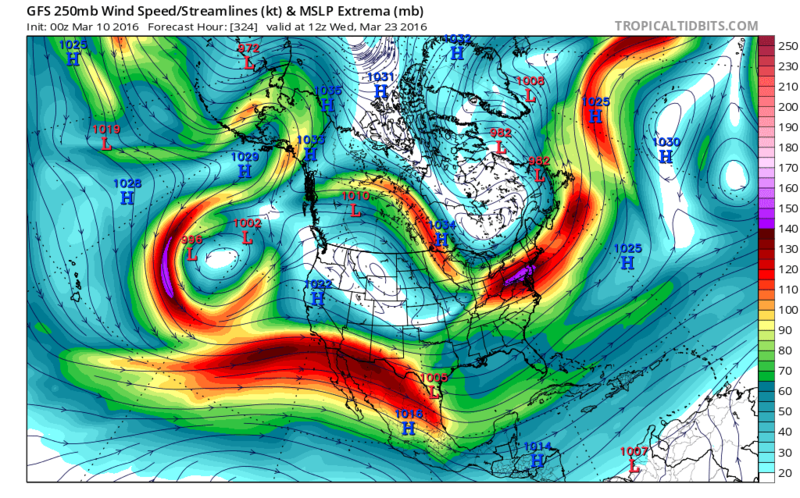 In this case, it appears that California may actually be in a favorable position to see an enhanced low-latitude storm track as the subtropical jet stream “undercuts” the ridge to the north. Southern California would likely fare well in such a scenario, though it remains to be seen if it actually comes to pass. It’s worth noting that decaying El Niño events can lead to very active late winter and spring periods in California, and hopefully that’s where this year is headed.